Innovative software to accelerate your Information Management! AIM has helped multiple federal and commercial customers quickly convert custom spreadsheets into effective business glossaries using this utility. The utility works by enabling the rapid mapping of spreadsheet fields (after conversion to a comma separated value file) to fields in the IBM Infosphere Business Glossary. This saves time and gets you up and running in a matter of days! We provide this software free to customers that engage our Enterprise Data Management services. Representing your knowledge can be a very academic subject that involves advanced semantic technologies; however, AIM is committed to changing that "barrier to entry" with software we currently have in alpha testing. 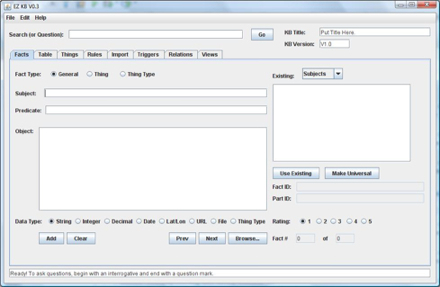 EZ KB stands for "Easy Knowledge Base" and this software makes it possible for average users to easily (and visually) capture knowledge, create and execute business rules and search the knowledge base. Introduction to Facts in a KB (about 8 minutes). Introduction to Inheriting Attributes (about 8 minutes). A simple genealogy inference (about 15 minutes). Create an Alert Trigger (about 5 minutes). Walkthrough of a Budget Alert (about 4 minutes).